Posted by Dave Emory ⋅ June 28, 2010Post a comment Email This Post Print This Post Tweet This! 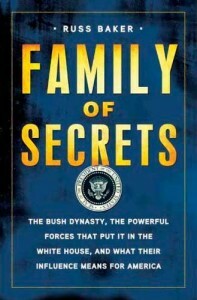 Introduction: Journalist Russ Baker has authored Family of Secrets: The Bush Dynasty, America’s Invisible Government and the Hidden History of the Last 50 Years–a potentially decisive, multi-generational political history and analysis of the Bush family. In this second of six interviews, Baker stretches out with analysis of one of the many investigative breakthroughs in his landmark volume. His career rising with the burgeoning development of the American Southwest and Texas in particular, George H.W. Bush was inextricably linked with the power networks that assassinated President Kennedy. Bush’s behavior with regard to that event and his apparent attempts at obfuscating his activities on 11/22/1963 are suggestive of guilt. Reviewing elements of discussion from FTR #711, the broadcast notes that throughout the career of George H.W. Bush, one finds the influence of the intelligence community, many of the elements of which were centrally involved in the events of 11/22/1963. His stewardship of Zapata Offshore Petroleum was typical in that regard. Zapata, as well as many of the intelligence-connected Wall Street interests whose bidding Poppy did, were deeply concerned over U.S. policy toward Castro’s Cuba. Zapata appears to have served as a front for various CIA operations against Castro, as well as for the pure collection of intelligence. Chronicling Bush’s rise and point of entree to the power elite of Dallas, Baker reviews the activities of Henry Neil Mallon. Something of a professional godfather to Poppy, Mallon helped Bush gain traction in the milieu that ran afoul of President Kennedy. Mallon founded the Dallas World Affairs Council, a policy forum for (among other interests) representatives of the petroleum and defense industries, whose influence in Texas was growing with the momentum of the Cold War, and whose wrath JFK incurred with his policies. A vigorous Russian exile community took root in Dallas, prospering in the petroleum and defense industries, as well as Cold War politics and intelligence matters. George H.W. Bush was close to many of these White Russians, George De Mohrenschildt, in particular. Born to a family that managed the Baku Oil fields for the Noble Family, the De Mohrenschildt clan was involved with anti-Soviet intrigue, espionage and the petroleum business dating back to the conclusion of the First World War. In addition to networking with the milieu of the Bush family, De Mohrenschildt’s acquaintances included Jackie Kennedy’s family–both set of acquaintances dating to the period between the World Wars. De Mohrenschildt became an apparent intelligence babysitter for Lee Harvey Oswald after he returned from the U.S.S.R., helping to position him as the patsy for Kennedy’s slaying. Another of Bush’s key acquaintances in Dallas was Jack Alston Chrichton, an oilman deeply involved with intelligence matters. Running for Governor of Texas at the same timethat Poppy was running for U.S. Senator, Chrichton headed up an army intelligence reserve unit whose ranks included many high ranking members of the Dallas Police Department, including Chief Lumpkin, who was in the lead car in Kennedy’s fatal motorcade and whose actions on that day raise questions about his possible involvement in the murder. Chrichton and Lumpkin’s superior Lieutenant Colonel George Whitmeyer (in charge of Army reserve units in East Texas) was also in the lead car. Chrichton was also instrumental in arranging for some of the White Russian community in Dallas to act as translators for Marina Oswald in the immediate aftermath of the shooting.These translators distorted Marina’s statements in such a way as to accentuate Oswald’s alleged guilt. It is worth noting that Chrichton had established a Cold War communications bunker in the basement of a building in downtown Dallas. Baker speculates that this installation may have served as a communications hub in the assassination. Curiously, Poppy Bush has never been able to satisfactorily account for his presence and actions in Dallas on 11/22/1963. (It is said that all people who were of the age of consciousness when President Kennedy was killed remember where they were and what they were doing when they heard JFK had been killed. That apparently does NOT include Poppy Bush.) Attending an oil drillers’ professional conference in Dallas the evening before the assassination, he may well have been in “the big D” on the morning of the killing, as well. Baker details Poppy’s attempts at covering his tracks, both with a phone call to the FBI providing himself with alibi, as well as a curious letter allegedly penned by Barbara Bush as she was having her hair done and in which she records her thoughts upon hearing that Kennedy had been killed. In that letter, Ms. Bush notes her husband’s association with the Ulmers, who were in town at the time. A long time CIA coup specialist, Al (husband of Doris, Barbara’s friend) was in Dallas at the time of the assassination. Barbara also misspells the name of Joe Zeppa, a Dallas oil man on whose private plane Bush had flown into Dallas. Both the curious behavior of Zeppa on that day and Barbara’s spelling of their friend’s name as “Zeppo” seem designed to throw investigators off. This is an amazing individual and researcher that you have there. In the tradition of Mae Brussel, John Loftus and yourself, Dave Emory, this person walks into those dark corridors no one dares to go. He is the incarnation of what is real journalism. Congratulation for having him on your show. Looking forward to hear the third episode! And keep on rocking!